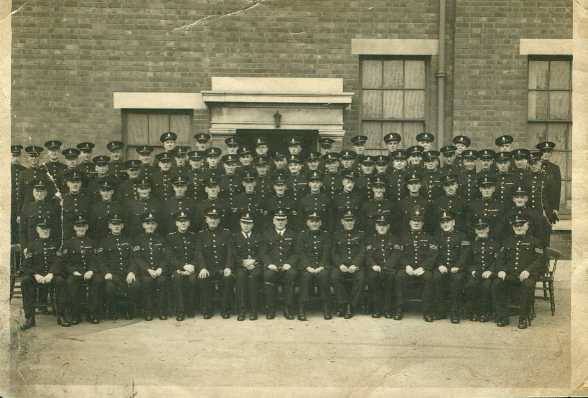 This picture of the Special Constables of Mansfield, was taken sometime in the 1940’s. I believe it was taken at the rear of the Police Station when it was on Station Street. The Specials, as they were called, were made up of men from all walks of life, they were all unpaid volunteer Police Officers, having the same powers as the Police Force.They became involved in nearly all the same tasks as them, dealing with antisocial behaviour, patrolling the streets and town, also dealing with complaints and solving problems. Having said that, they did get uniforms and any expenses. They were actually an unpaid link between the regular police force and the people in the community.They were part time law enforcement officers working with Police Stations and the regular police. There is only one Special Police Force that I know of that were paid full time salary, and that is the Atomic Energy Police. My Father in law was a Special Constable for many years, and is one of those in the photograph. He was my wife’s father, Thomas Allsop, a fine man from Woodhouse. Thats a fine picture you’ve put up there. My Great Grandfather was a ‘special’ around that time. Would there be a chance you had any names to put to the faces? His name was Harry Tomlinson and he’d have been about sixty years old at the time. Hello Paul, I promise not to make any reference to your name, that is unless your father went to High Oakham School and I played football with him. Must be quite interesting being a Special in our old town these days. Very different in my days there, the only time I did any policing was, a Regimental Policeman in the Armed Forces in the Middle East.Those were the days. The British Transport Police, Ports Police and Tunnels Police are all Special Police Forces too. I am currently a Special at Mansfield but I dare say our numbers are less than a quarter of those!